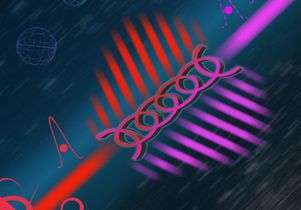 In previous studies, photons have typically been entangled by one dimension of their quantum properties—usually the direction of their polarization. In the new study, researchers demonstrated that they could slice up and entangle each photon pair into multiple dimensions using quantum properties such as the photons' energy and spin. This method, called hyperentanglement, allows each photon pair to carry much more data than was possible with previous methods. Quantum entanglement could allow users to send data through a network and know immediately whether that data had made it to its destination without being intercepted or altered. With hyperentanglement, users could send much denser packets of information using the same networks. The research, published today in Nature Photonics, was led by Zhenda Xie, a research scientist in the lab of Chee Wei Wong, a UCLA associate professor of electrical engineering who was the research project's principal investigator. Researchers from MIT, Columbia University, the University of Maryland and the National Institute of Standards and Technology were also part of the team. Albert Einstein famously described quantum entanglement as "spooky action at a distance" because it seems so improbable that what happens to one particle in an entangled pair also happens instantly to the other particle, even over great distances. The phenomenon exceeds the speed of light. In the new study, researchers sent hyperentangled photons in a shape known as a biphoton frequency comb, essentially breaking up entangled photons into smaller parts. In secure data transfer, photons sent over fiber optic networks can be encrypted through entanglement. With each dimension of entanglement, the amount of information carried on a photon pair is doubled, so a photon pair entangled by five dimensions can carry 32 times as much data as a pair entangled by only one. The result greatly extends from wavelength multiplexing, the method for carrying many videos over a single optical fiber. "We show that an optical frequency comb can be generated at single photon level," Xie said. "Essentially, we're leveraging wavelength division multiplexing concepts at the quantum level." Potential applications for the research include secure communication and information processing, in particular for high-capacity data transfer with minimal error. This could be useful for medical servers, government data communications, financial markets and military communication channels, as well as quantum cloud communications and distributed quantum computing. "We are fortunate to verify a decades-old theoretical prediction by Professor Jeff Shapiro of MIT, that quantum entanglement can be observed in a comb-like state," Wong said. "With the help of state-of-the-art high-speed single photon detectors at NIST and support from Dr. Franco Wong, Dr. Xie was able to verify the high-dimensional and multi-degrees-of-freedom entanglement of photons. These observations demonstrate a new fundamentally secure approach for dense information processing and communications." This could be useful for medical servers, government data communications, financial markets and military communication channels, as well as quantum cloud communications and distributed quantum computing. ..not to mention the private individual. In this day and age I want my data - as trivial as it may be - to be inaccessible to anyone other than the intended recipient. so if we can ever get quantum entanglement to work well with very low decoherence then instead of needing 500 qubits we might only need to entangle 50 or so ... or we may be able to use the qubits for both processing and memory as each demension could be used for something totally different ?? Its not apparent in this article how "entanglement" rather than multiple variable (multi-bit)encoding is carrying the information. The use of the word "could" in the centre of the article implies they haven't even tried it or demonstrated it before publishing. Besides the word "could" being used to describe possible applications (i.e. not demonstrated) there's one of the instances is actually preceded by the word "demonstrated". There's also supplementary links to make things more apparent for you (unfortunately the juicy stuff is behind a pay wall). If we want to play the semantics game, your "centre" meaning middle implies that there is the word "could" in the middle of the article. There are such words in the beginning of the article (within the first 150 words out of ~500) and the end of the article (within the last 100 words out of ~500). None apparent in the middle of the article and it implies that you didn't actually comprehend what you read. There is nothing in the post allowing for evaluation of what researched actually did, short of futuristic claims and fantastic speculations. What is really disturbing is that we need to pay to see research results obtained by employees of state run UCLA. An informational apartheid. "With the help of state-of-the-art high-speed single photon detectors at NIST and support from Dr. Franco Wong, Dr. Xie was able to verify the high-dimensional and multi-degrees-of-freedom entanglement of photons. You can do it at home, buy single photon detector online for $5000. "connected to each other and act in unison no matter how far apart they are"
The Pipe dream of quantum entanglement. We should consider this as standard equipment on satellites in system and in future precursor missions to nearby stars. We could then communicate instantly with our probes even if it was in the Sirius or Centauri or Epsilon Eridani systems. With no 'violation' of the cult of Albert either. Nice, instant video and whatever no matter what the distance. Bet this is why there are no signals for SETI to hear. It is not because the signals are not there; but rather a better way was found to send them.....and E.M. Waves AIN'T IT!!! Quantum information. Not classical information. Get it straight. Quantum information cannot be used for classical information transmission. Quantum information allows 2) and 3) but not 1) (because that would constitute a measurement and break entanglement). However, quantum information allows encryption, because encryption does NOT add information to a message and therefore does not fall under "not faster than the speed of light"-limit imposed on classical information transmission. We should consider this as standard equipment on satellites in system and in future precursor missions to nearby stars. could then communicate instantly No. No, no, no, no and no. You're acting here like Paris Hilton during her first night..;-) Never say never... - the superluminal transfer of CLASSICAL information http://arxiv.org/...09.2736. Did you read what you are quoting? "Here I suggest that all these claims are erroneous and are based on a misinterpretation of a purely classical measurement accurately described by Maxwell's equations." Yes and I quoted antialias_physorg, not You. Nimitz experiment demonstrates group velocity (which can exceed speed of light). It's like panning a laser pointer accross the moon. No information (and no entity) in that experiment moves faster than light. The surface ripples cannot penetrate the board and they're reflected there. But each surface ripple is also connected with underwater wave, which can pass the board freely in much faster way, than the surface ripples. At the other side of board the underwater sound waves recombine again under formation of surface ripples. Bad analogy. Water waves are nowhere near the speed limit of information. Light is. Entirely different physics apply.